So, you beat Doom VFR and you are looking for another game? You aren’t a fan of RPGs so Dead Effect 2 VR isn’t quite what you’re looking for? 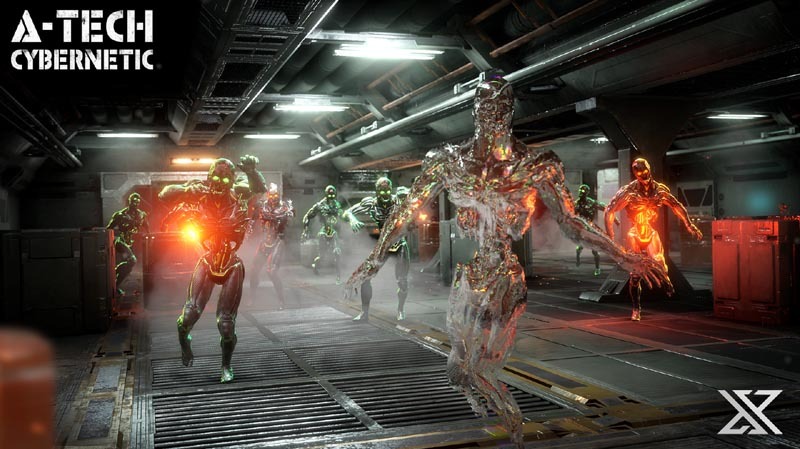 Well, look no farther than A-Tech Cybernetic, the sci-fi mutant shooter that will quench your thirst for creepy atmosphere and unrelenting carnage. 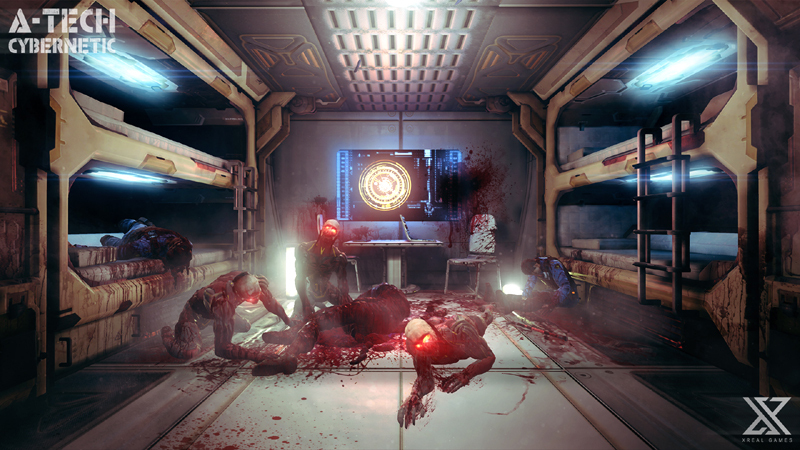 I’m so sick of these mother loving space zombies in this mother loving science facility! A-Tech Cybernetic is a simple game to explain. Waking up without any memories, and thrust into another’s mind, you find yourself in a biomedical company overrun by hordes of mutants. 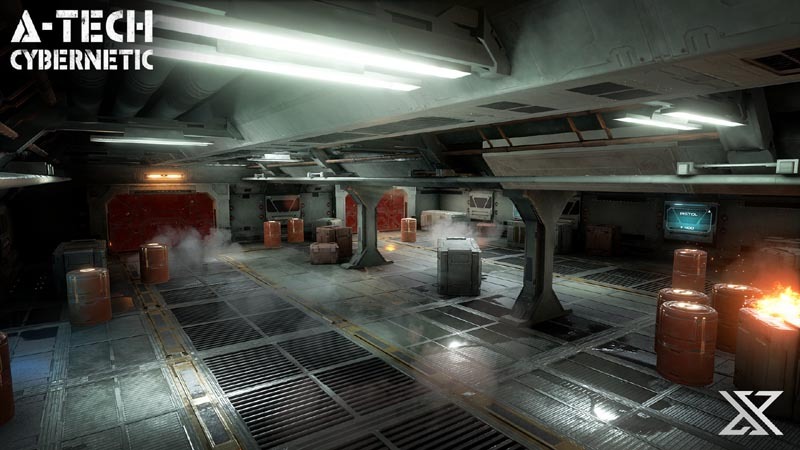 You explore a spaceship (thumbstick/touchpad movement or teleportation) picking up guns and ammo all while shooting mutant horde plaguing the facility. Why are you there and how can you escape? The game explores these questions while you scramble to find supplies and another addition to your arsenal. There’s also a horde mode, which is fun, but doesn’t require much explanation to gamers by now. It’s a blast, and a welcome addition to the game. Upon full release, the developers have stated they will have a co-op option in the game as well, which is great to hear and hopefully comes to fruition sooner than later! Guns in A-Tech Cybernetic don’t feel like they have much weight to them, but that’s ok because similar to Arizona Sunshine, you will be finding weapons littered around the environment, so they feel like toys you can easily toss away. 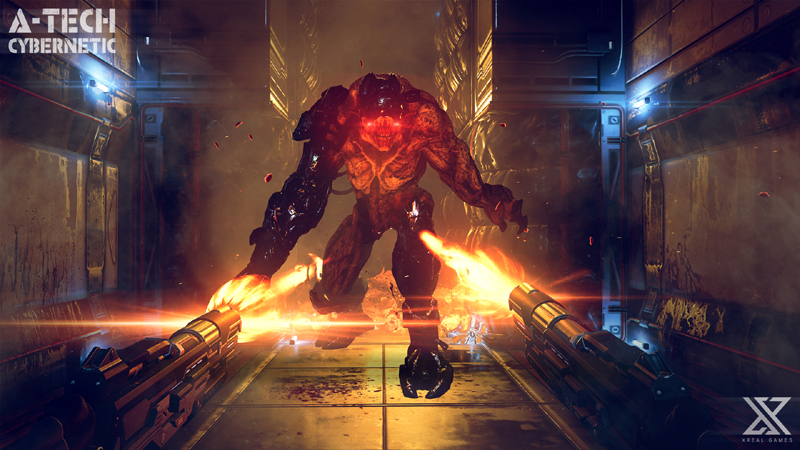 My personal favorite was the shotgun, which made me feel like I was playing old school Doom again. You reload your guns by doing the now standard moving of your gun to your belt quickly. I did find myself routinely running out of ammo and having the run from enemies while searching for more ammo, which helped add tension to the game. When the horde comes, your head shot skills better be on point! The enemies in A-Tech Cybernetic vary enough to not feel too repetitive. A few certain enemy types made me yell and want to flee, including a zombie-like enemy who runs at you with startling speed, often appearing from seemingly out of nowhere. Enemies can take a hit and don’t go down instantly, which made getting headshots and managing my ammo supply feel rewarding. Visually A-Tech Cybernetica looks great. They really nailed the feeling of some scientific lab that had something go horribly wrong, and the layout is varied enough that each place felt distinct, and backtracking was kept to a minimum. Enemies animate well and carry enough detail to add to the disgusting creep factor and the rag-doll physics add the satisfaction of every successful headshot as the now headless bodies sprawl lifelessly to the ground. The levels all look pretty darn swell! From an audio perspective, enemies sound great, and the background music kept me in suspense or excited enough that from moment to moment I am either anticipating an attack or launching the attack myself. The longer I played the more easily I recognized audio cues as to what was about to happen. The voice of the man you took over the body of is also entertaining, as he is not pleased to have you controlling his body, and he lets you know it. One thing that did bother me was that, in a few sections, I realized I had to use teleport to overcome an obstacle. One area in particular, you need to teleport over some flames, rather than walk through them. It took me a while to remember I even had teleport as an option. This may be intentional on the developer’s part, but I’m not particularly keen on throwing things like this in to games, as some players may never progress not realizing they simply weren’t remembering a mechanic they thought would only be useful for movement. I also disliked how random the rotation options felt. I think they were set to 90 degrees, but every time I flicked my thumbstick, I always turned too far. I’d like to see the option to rotate by as much or as little as I’d like, at this stage in the FPS VR game, full locomotion should be a staple. I would also like to see the distance of teleportation increased some, I didn’t use it as my default choice of movement because it didn’t feel like I was getting anywhere very quickly. I did like that teleportation was directional and let me face the direction I desired as easily as in games like Robo Recall. I wonder if he’s a lefty or a righty? Overall, A-Tech Cybernetic is a solid FPS that I will continue to play, and I look forward to playing it with friends upon its full release. It’s also worth mentioning the devs are very friendly and open to criticism, and are very active on Steam. What Would I Pay At 14.99 A-Tech Cybernetic is perfectly priced, not overly expensive and you really get a good amount of game. At this price I could easily see it ending up a much talked about title in the coming months. 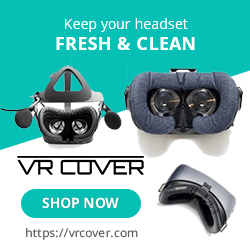 Xreal Games provided The VR Grid with a code for review purposes and, regardless of this review, we thank them for that! Not all the games content is available yet...I WANT IT NOW!! !